Casarena is nestled inside the gated master-planned Villas del Mar in the quaint resort community of Puerto Aventuras, Mexico. Villas del Mar -resides along a stretch of soft, white sandy beach, lush with tropical vegetation and expansive views of the famous Fatima Bay. Casarena provides direct access to the sun drenched beach and warm Caribbean waters, our world-class accommodations provide guests with a spectacular vacation experience. Inspired by natural tropical elements this vacation condo offers guests garden and swimming pool views from the private terrace. The beautiful pool design with zero-edge infinity pool creates an outstanding centerpiece for this beachside property. Casarena is ground floor and decorated with casual beach elegance, enjoy relaxing time in the jacuzzi at your private terrace surrounded by indigenous flora, coconut trees, flowering bougainvillea and shrubs all native to this tropical region of Mexico. This world-class rental property awaits your next visit. Comfortable and thoughtfully designed with guest spaces in mind: Living area, formal dining and outdoor dining this rental home benefits from the warm breezes and lots of sunshine. 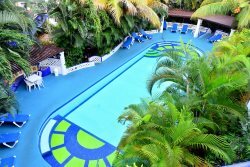 2 bedroom suites sleep a total of 6 and contain the requisite comforts discerning vacationers expect. Master Bedroom with king bed and ensuite full bath with shower. Guest Bedroom with two full beds and ensuite bath with shower. This vacation rental property provides complete executive-level service and has all the details needed to cater to the most discerning guest. Villas del Mar is within walking distance to the marina mall restaurants, bars, shopping and Omni Beach club. Concierge services include booking airport transfers; Deep-Sea Fishing, Scuba Diving, Golf, Jungle Adventures, as well as Day Trips to Tulum, Xcaret, Xel-ha Simply call or email the types of activities you would be interested in as part of your stay and our Concierge will arrange everything. Please ask for pricing for activities, taxes and any other related fees. We will arrange everything and insure that only the best excursion providers or other types of activities are utilized. Guest Bedroom: Two Queen size beds. Security damage deposit $300 USD is required.